A pair of Regency English stone fireplaces, with carved roundel corner blocks, conforming moulded panels to jambs and frieze. All beneath a simple shelf. 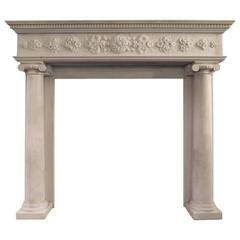 One being slightly smaller than the other, early 19th century Opening size 72.5cm W x 101.5cm H.
Antique fireplace mantel made of stone. 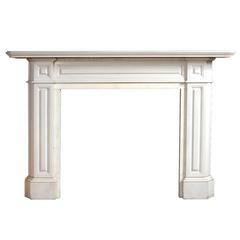 Antique Regency grey stone fireplace surround, with full fluted legs and breakfront frieze, circa 1820. Pictured with an antique grate, sold separately. 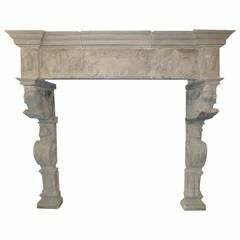 16th century antique stone fireplace mantel the internal measures are: 155 cm-162 cm height.